Connections, a 64-page, full-color, glossy magazine-style publication – will be mailed to approximately 2,300 Jewish households in the area the last week in December or the first week in January. About another 1,200 copies will be available at numerous locations (in January, February and March 2017) including several selected Supermarkets, local Synagogues, and the Jewish Federation office. It will also be included in packages mailed to newcomers and people who are considering a move to the area. Readers of this annual guide are wealthy, health-conscious, well-educated, and maintain high levels of discretionary income, which translates into BUYING POWER for your products or services. Connections will cover everything a local Jewish resident or an out-of-towner visiting, or considering a move to the area will need to know when it comes to all-things-Jewish in Lee & Charlotte counties. The Federation’s 46-page Membership Directory (the annual “phone book”) is now mailed with copies of Connections. Introduce your business to a powerful demographic! 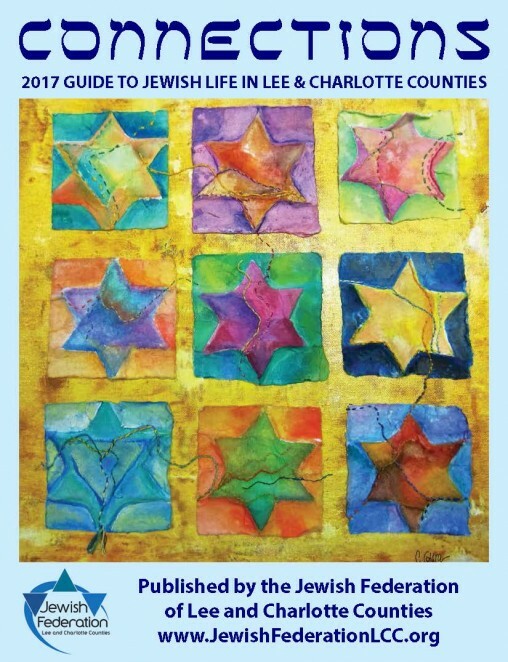 a 56-page, full-color, glossy magazine-style publication – will be mailed to 2,300 Jewish households in Lee & Charlotte counties. An additional 1,200 copies will be available at several locations including five Publix Supermarkets. Connections covers everything a local Jewish resident or an out-of-towner visiting, or considering a move to the area will need to know when it comes to all-things-Jewish in Lee & Charlotte counties. Connections targets and attracts the readers you want to reach. We offer six different ad sizes to meet everyone’s budget. And since this Community Resource Guide is an annual publication, your ad will be seen throughout the year. Want to reach 10,000 Jewish households in the Lee & Charlotte Counties area? Premium positions are going fast! For more information contact James Lewin at 239.634.6923 or jameslewin@jfedlcc.org or Nancy Kuehne at 239.822.6150 or nancy.lchayim@gmail.com.